Mesmerizing sphere made in Knightsteel with round brilliant diamonds and 24K Gold shaped inlay in a pattern reminiscent of the Byzantine Era. 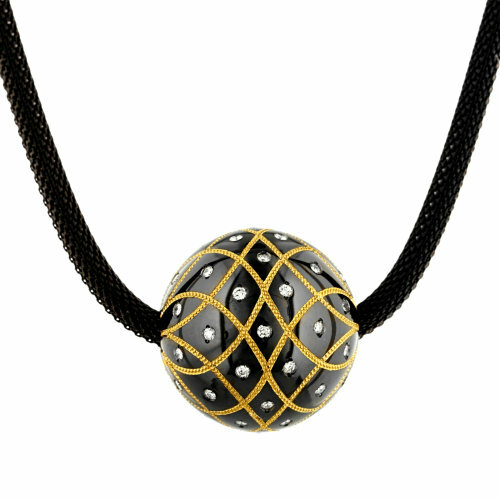 Mesmerizing sphere made in Knightsteel with 24K Gold shaped inlay in a pattern reminiscent of the Byzantine Era. Fifty-two .015 ct. round brilliant diamonds seem suspended in the deep black steel. These diamonds are D to F in color and Internally Flawless to VVS in clarity, with excellent polish, proportions and symmetry (.78 ct. total). The 17″ German made chain is a flexible black steel mesh with an 18K Gold tube clasp.